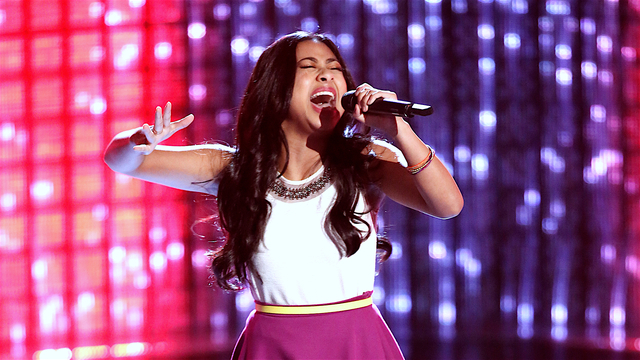 Anatalia Villaranda’s outstanding rendition of the pop hit was one of the highlights of season 12 premiere of the reality television singing competition. Coaches Alicia Keys, Blake Shelton, Adam Levine and Gwen Stefani gave a standing ovation for Villaranda. It took more than a minute before Keys and Shelton hit their buttons simultaneously. Levine and Stefani turned their chairs moments later. “The braveness that you have is something you can’t teach. You have this raw ability and I do believe that you can win this entire thing,” Maroon 5 frontman told Villaranda. Previously, Villaranda auditioned for the final season of another hit reality TV singing competition, American Idol. Born on November 18, 1999, Villaranda lives in San Diego, California and is into singing, dancing and acting. A full blood Pinay, Villaranda’s mom hails from Bacolod while her dad is from Manila. She performs at various venues from San Diego to Los Angeles. “How lucky am I that you listened and turned for me?! I am so grateful to The Voice, and all of you for the support!!! And I am so very lucky that Alicia Keys PICKED ME, so I could choose to be on her team!! !” Villarando wrote on her Facebook page.